Aksorn Thepprasit School Bang Lamung 0.79 Km. 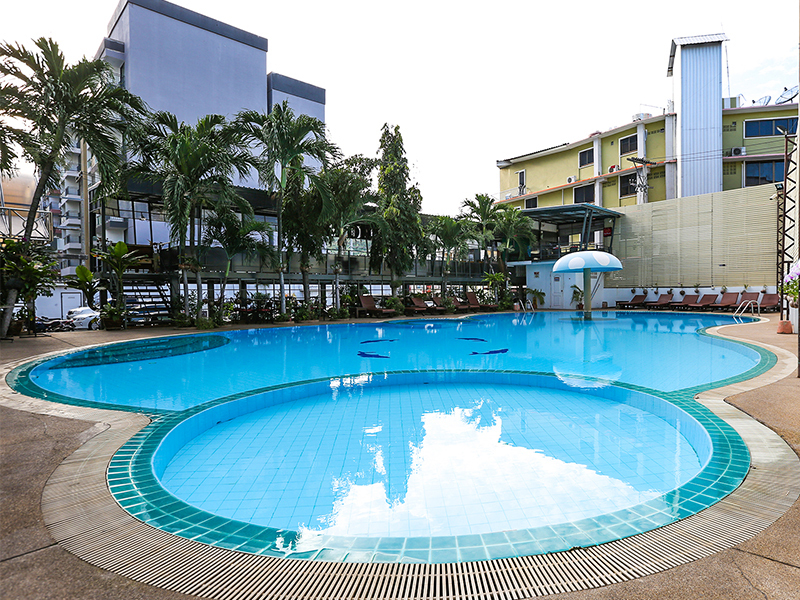 Home Study Center Rajabhat University Suan Dusit 0.82 Km. Pattaya Police Station 4 0.85 Km. Burapha Phatthanasart School 1.34 Km. Vocational Training School Bang Lamung 1.44 Km. Muang Pattaya 7 School 1.63 Km. 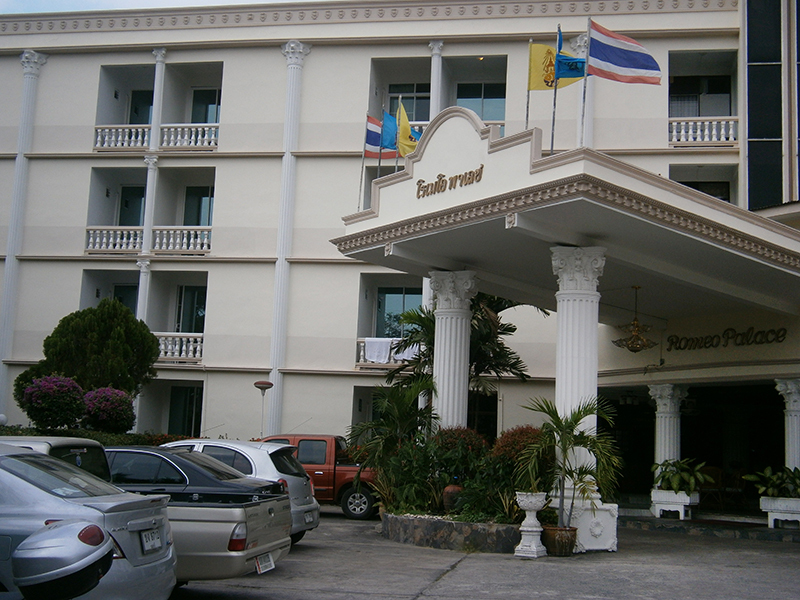 Muang Pattaya 6 School 1.67 Km. Phi Ni Phi Kindergarten 1.89 Km. Racha Panit Navy School 1.95 Km. Aksorn Pattaya School Bang Lamung 2 2.04 Km. Chon Buri Legal Execution Department 2.29 Km. Pattaya Arunothai School Bang Lamung 2 2.30 Km. Chon Buri Revenue Department Area 2 2.30 Km. Vicha Eak Cooking School 2.33 Km. Pattaya Police Station 3 2.39 Km. Kiattikhun Thai Massage School 2.42 Km. Provincial Electricity Authority Jomtien Branch 2.43 Km. Wat Bunsamphan School 2.64 Km. Pattaya Suksa and Computer School 2.74 Km. 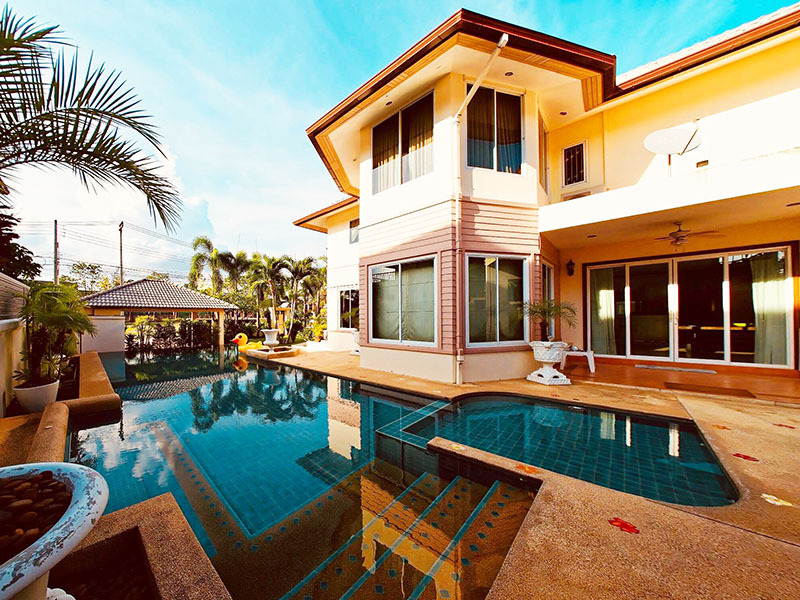 Punnapha Pool Villa is a private luxury Thai Modern Style Villa, located in South Pattaya, 500 metres from the highway Sukhumvit Road, just 2 minute ride to Tesco Lotus, 4 minutes to Big C, 8 minutes to King Power Duty Free Shop, 10 minutes to HaborLand, 12 minutes to Walking Street - Nightlife South Pattaya and Pattaya Beach. It's very convenient within 20 minutes to get t	o the other areas e.g. Nongnuch Botanic Park, Central Pattaya Department Store, Cartoon Network Water Park and Pattaya Floating Market. This private Thai villa has been decorated with wood furniture. 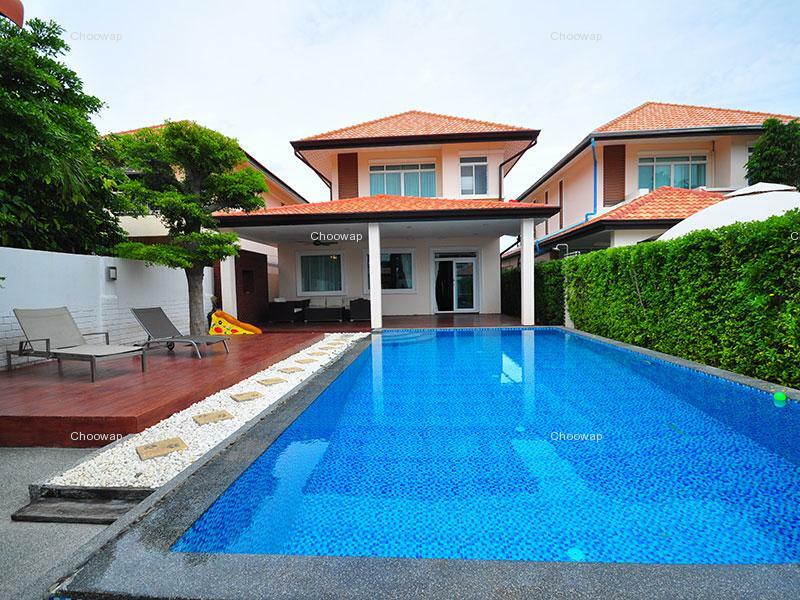 Punnapha Pool Villa is a 2-storey building, attached with a chlorine 4*7 swimming pool. 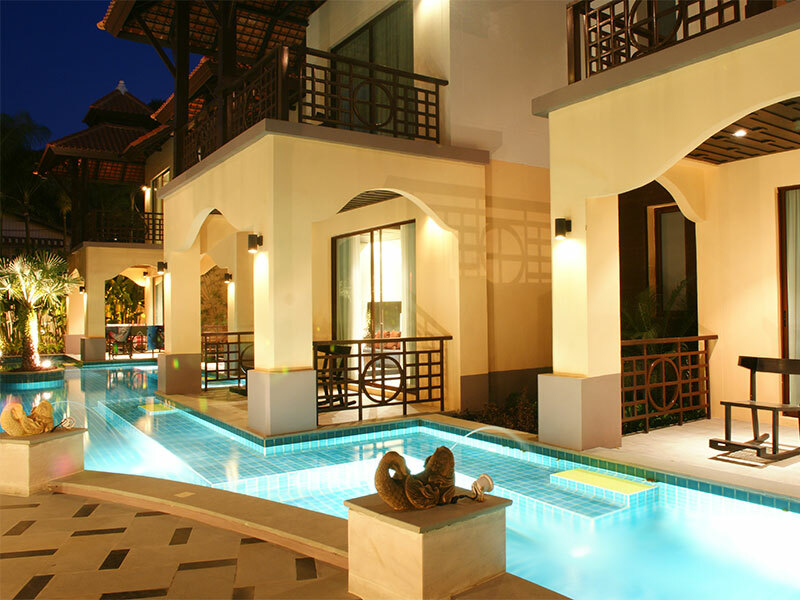 This villa offers 4 spacious bedrooms and 5 bathrooms, accommodating up to 8-16 guests comfortably. Master bedroom comes up with one large bed (6 ft), en-suite bathroom with outdoor bathtub, dressing area, set on the 2nd floor of the building. The 4th bedroom is next to the swimming pool with one 6-foot double bed, on the ground floor suitable for elderly or young children. Living room are elegantly decorated with luxury sofa, adaptable to be a bed for 2 persons, 43" smart TV, CCTV, connecting to dinning area and kitchen. Kitchen offer modern design with full amenities: 4-hole electric stove, electric kettle, 1.8-litre rice cooker, toaster, full sets of kitchenware, microwave and refrigerator. In-house car park is good for 2 cars while the outside can be parked more. WiFi is free of charge in the entire area. Password is given in the living room. 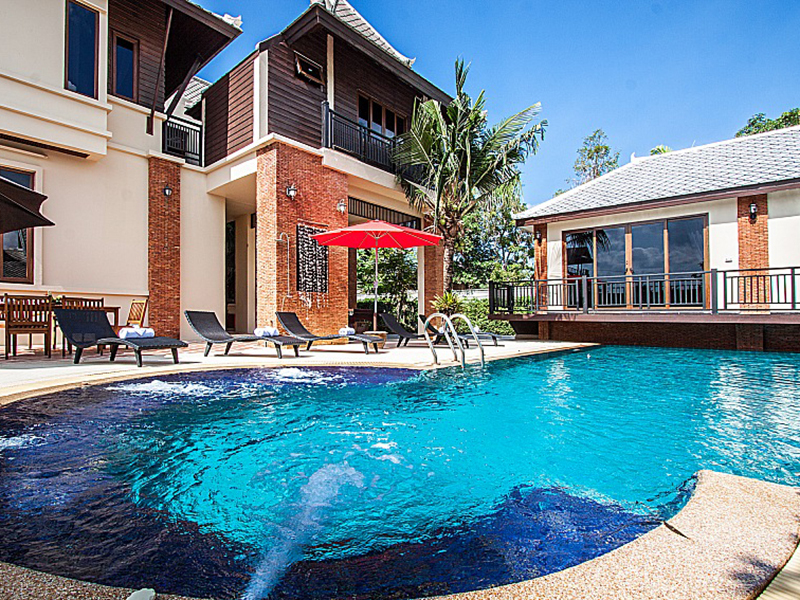 Wooden sala next to the yard and the pool, ideally sets for a group party. read more..